Louis Braille's life is captured in a new biography entitled: Louis Braille: A Touch of Genius. In the French town of Coupvray, near Paris, there stands a little stone house that, in 1809, was the home of the local harness maker, Simon René Braille, his wife Monique, and their growing family. On January 4th of that year, the house grew a little livelier with the birth of their fourth child, Louis. Louis was a bright and inquisitive child, characteristics that were to play a role both in the tragic accident that caused his blindness and in his triumph over the limitations to reading that were the normal consequences of blindness at that time. At the age of 3, while playing in his father's shop, Louis injured his eye on a sharp tool. Despite the best care available at the time, infection set in and soon spread to the other eye as well, leaving him completely blind. Fortunately, Louis' parents, together with the local priest and school teacher, were alert to his superior learning abilities and eager to provide him with the opportunity to develop them to the fullest extent possible. So, when Louis became of school age, he was allowed to sit in the classroom to learn what he could by listening. Despite an initial assumption that his handicap would keep him well back of the other pupils, he was soon leading the class. At the extraordinarily young age of ten, Louis was sent on scholarship to the Royal Institution for Blind Youth in Paris. There too, most instruction was oral, although there were some books in a raised-print system developed by the school's founder, Valentin Haüy. Once again, the diligent Louis did well at his studies, and moreover developed a considerable talent for music, first at the piano and then at the organ. The general idea of a tactile alphabet that would allow blind persons to read and write also began to take shape in his mind at this time. It was a French army captain, Charles Barbier de la Serre, who actually invented the basic technique of using raised dots for tactile writing and reading. His original objective was to allow soldiers to compose and read messages at night without illumination. Barbier later adapted the system and presented it to the Institution for Blind Youth, hoping that it would be officially adopted there. He called the system Sonography, because it represented words according to sound rather than spelling. While the Institution accepted Sonography only tentatively, Louis set about using and studying it with his customary intensity. Soon he had discovered both the potential of the basic idea and the shortcomings in some of Barbier's specific provisions, such as a clumsy 12-dot cell and the phonetic basis. 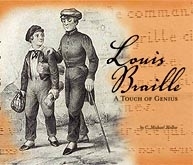 Within three years, by age 15, Louis had developed the system that we know today as braille (see next section), employing a 6-dot cell and based upon normal spelling. He also went on to lay the foundations of the braille representation of music, and in 1829 published the Procedure for Writing Words, Music, and Plainsong in Dots. Although Louis Braille went on to become a loved and respected teacher, was encouraged in his research, and remained secure in his own mind as to the value of his work, his system of touch reading and writing was nevertheless not very widely accepted in his own time. Louis Braille died on January 6, 1852. In the years that followed, the practicality as well as simple elegance of his braille system was increasingly recognized, and today, in virtually every language throughout the world, it is the standard form of writing and reading used by blind persons. If a blind child is taught braille skills with the same sense of importance that is rightly attached to the teaching of print skills to sighted children, he or she will grow up able to read at speeds comparable to print readers, a life skill of inestimable value. Over 150 years after Louis Braille worked out his basic 6-dot system, its specific benefits remain unmatched by any later technology -- though some, computers being a prime example, both complement and contribute to braille. Each braille character or "cell" is made up of 6 dot positions, arranged in a rectangle comprising 2 columns of 3 dots each. A dot may be raised at any of the 6 positions, or any combination. Counting the space, in which no dots are raised, there are 64 such combinations (that is, 2 to the 6th power). For reference purposes, a particular combination may be described by naming the positions where dots are raised, the positions being universally numbered 1 through 3 from top to bottom on the left, and 4 through 6 from top to bottom on the right. For example, dots 1-3-4 would describe a cell with three dots raised, at the top and bottom in the left column and on top of the right column. In the original French, and also in English and all other languages written in the Roman alphabet, that pattern would most often be used for the letter "m", but it can also have other meanings depending on language, braille code and context. Because the 64 distinct characters are never enough to cover all possible print signs and their variants, it is necessary to use multi-character sequences for some purposes. Often this is accomplished by using certain characters as "prefixes" or "indicators" that affect the meaning of subsequent cells. For example, in English a dot 6 before a letter indicates that the letter is a capital, whereas otherwise it is understood to be lower case. For another example, dots 3-4-5-6, called the "numeric indicator", causes certain following letters (a through j) to be reinterpreted as digits. Dot height, cell size and cell spacing are always uniform, and so many significant characteristics of the text, such as italics used for emphasis, must be handled by such indicators in braille. An exception is that formatting, such as the centering of main headings, is commonly used in braille in much the same way, and for most of the same purposes, as in print. Separate braille codes may be used for notation systems other than natural languages, such as music, mathematics and computer programming, and even for highly specialized pursuits such as chess. The basis of such codes remains an association between the 64 possible braille characters, or distinct sequences of such characters, and the symbols and other notational elements of interest. There is current research, under the auspices of the International Council on English Braille (ICEB), as to whether some of these separate codes, notably for mathematics and the sciences, should be combined along with the literary code into a single Unified Braille Code (UBC) for English. The size of the braille cell is such that only about 25 lines of about 40 cells each, that is 1000 characters, can fit on a page of the usual size, which is about 11 inches wide by 11 or 12 inches deep. This contrasts with the 3500 or so characters that will fit on a standard, smaller, typed page. Moreover, braille paper must be much heavier to hold the dots, and the dots themselves considerably increase the effective thickness of a page. The result is that paper braille is very bulky. To mitigate this problem somewhat, most larger braille books are published in "interpoint", that is with the embossing done on both sides of each sheet, with a slight diagonal offset to prevent the dots on the two sides from interfering with each other. But even in interpoint, a standard desk dictionary is likely to occupy a whole bookcase in braille. Partly because of the bulk problem, and partly to improve the speed of writing and reading, the literary braille codes for English and many other languages employ "contractions" that substitute shorter sequences for the full spelling of commonly-occurring letter groups. For example, "the" is usually just one character in English Braille, not only in the definite article but also in words such as "lather" and "chrysanthemum". However, that contraction is not used in words such as "motheaten" or "sweetheart", because of the way those words are constructed or pronounced. In other words, phonetics does play a role in modern braille -- but not so as to compromise an accurate representation of spelling. Wherever the braille character for "the" appears, the reader can be sure that it stands for exactly those three letters and not some other sequence that may sound the same. When contractions are used, the braille is usually called "grade 2" in contrast to "grade 1" transcriptions where all words are spelled out letter-for-letter. In English, which has 189 contractions, almost all braille is grade 2. The only exceptions are transcriptions for special purposes, such as for beginning readers. However, there are advocates for making grade 1 braille more widely available, so that, for example, persons who become blind later in life will have less to memorize and hence will find braille more immediately useful. The basic simplicity of the braille system makes it easy to miss some of the depth and subtlety that are the real reasons for its success for so many years. Computer technologists in particular may consider the 6-dot cell to be simply analogous to a 6-bit byte, the kind that gave rise to 64-character codes such as BCD (Binary Coded Decimal) in an earlier computing era. That analogy is technically correct and useful up to a point, but the fact that braille is read by the human finger and the passing dots are turned into meaning by the human mind means that braille codes must have characteristics that go well beyond the somewhat arbitrary and mechanical codes used by computers. Louis Braille originally laid out the 63 nonblank characters in a seven-line table, an arrangement still universally used for the study of braille. This table, which is given below, is by no means merely a listing by numeric value of the braille "byte" but rather reflects consideration of the role that certain kinds of dots, such as "upper" (dots 1 and 4) and "left" (dots 1, 2 and 3) play in basic symbol recognition, and moreover the importance of balancing both dot placement and "density" throughout symbol sequences, words, and sentences. As a result of attention to these important human factors, readers of braille commonly read in whole words and quickly grasp larger passages, as do readers of print. For reference purposes, the last item in each entry, in red, is the "North American ASCII Equivalent" character(s) that represent that braille character. The code formed by those ASCII assignments is fundamentally a machine code, used for communication with braille embossing printers and braille keying devices. Other such codes are also in use, especially outside North America. It is not formally defined as a transcription code, that is for direct human use, but nevertheless so many people use the devices involved that the code is widely understood and often used informally in technical discussions about braille. It also forms the basis for (but is not identical to) the Computer Braille Code (CBC), a code adopted by the Braille Authority of North America (BANA) for the representation of computer programs and other computer notation. Note that, within the first four lines of the table, every character contains both of these features: (a) at least one top-row dot (dot 1 or dot 4), and (b) at least one upper left-column dot (dot 1 or dot 2). ⠮ dots 2-3-4-6 contraction "the" ! ⠹ dots 1-4-5-6 contraction "th" ? ⠐ dot 5 prefix for certain contractions "
⠨ dots 4-6 decimal point, emphasis indicator, prefix for certain contractions .